Over the years, ConCorda has hosted many quartets in residence, from young quartets to internationally established ones. Here is a list of the quartets that ConCorda has hosted since it’s beginning. Since its formation in 2002, the Navarra Quartet has built an international reputation as one of the most dynamic and poetic string quartets of today. Selected for representation by the Young Classical Artists Trust (YCAT) from 2006 to 2010, they have been awarded the MIDEM Classique Young Artist Award, a Borletti- Buitoni Trust Fellowship, a Musica Viva tour and prizes at the Banff, Melbourne and Florence International String Quartet Competitions. The Navarra Quartet has appeared at major venues throughout the world including the Wigmore Hall, Amsterdam Concertgebouw, Luxembourg Philharmonie, Berlin Konzerthaus, Sydney Opera House and international festivals such as Bath, Grachten, Sandviken, Schwetzinger, Rheingau, Mecklenburg- Vorpommern, Huntingdon (Australia), Aix- en-Provence, Bellerive and the BBC Proms. Further afield they have given concerts in Russia, the USA, China, Korea and the Middle East and have been broadcast on BBC Radio 3, RAI 3 (Italy), Radio 4 (Holland), SWR (Germany), Radio Luxembourg and ABC Classic FM (Australia). The Quartet has collaborated with artists such as Li-Wei, Guy Johnston, Mark Padmore, Allan Clayton, Francesco Piemontesi, John O’Conor, Simone Young and the National Youth Orchestra of Great Britain. Highly-acclaimed recordings include Haydn’s The Seven Last Words for Altara Records and a disc of Pēteris Vasks’ first three String Quartets for Challenge Records, which they recorded whilst working closely with the composer himself. The recording was described by critics as “stunning”, “sensational” and “compelling”, and was nominated for the prestigious German Schallplattenkritik Award. More recently, the Navarra Quartet recorded a disc for NMC Records featuring the music of Joseph Phibbs and future recording plans include the three great quartets of Schubert and Britten. Formed at the Royal Northern College of Music, they commenced their studies under the guidance of the late Dr. Christopher Rowland. Their development continued with studies in Cologne with the Alban Berg Quartet, Pro- Quartet in Paris, the International Musicians Seminar at Prussia Cove and from residencies at the Britten-Pears School in Aldeburgh and at the Verbier Festival in Switzerland. A constant desire to evolve sees the quartet play regularly to revered musicians such Eberhard Feltz, Ferenc Rados and Gabor Takacs Nagy. They also enjoy teaching the next generation in masterclass and summer courses. They recently completed a three year residency as the Associated Ensemble at the Birmingham Conservatoire. The Quartet plays on a variety of fine instruments which include a Hieronymus II Amati and Jean-Baptiste Vuillaume (kindly loaned to Marije by a generous sponsor through the Beares International Violin Society), an unknown, old English viola and a Grancino cello made in Milan in 1698, generously on loan from the Cruft – Grancino Trust which is administered by the Royal Society of Musicians.Highlights this season and beyond include appearances at the Queen Elizabeth Hall, Wigmore Hall and the Concertgebouw, Amsterdam. The Navarra Quartet are excited to direct the 5th edition of the Weesp Chamber Music Festival in the picturesque town of Weesp, close to Amsterdam. To find out more, visit www.navarra.co.uk. Winners of the 2012 1st International Sandor Vegh String Quartet Competition in Budapest and 2nd prize winners at the 2014 Orlando International String Quartet Competition; the Benyounes Quartet is gaining a reputation as one of the most engaging, dynamic and successful young quartets to have emerged from the UK in recent years. 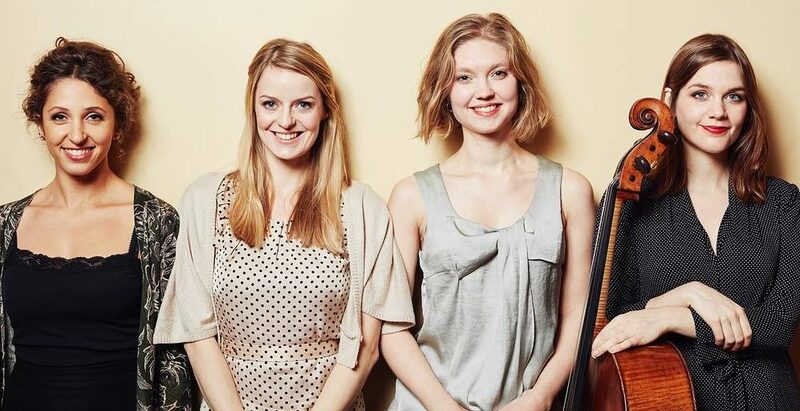 Formed in 2007 at the Royal Northern College of Music, the Benyounes Quartet went on to win the Royal Philharmonic Society’s prestigious Julius Isserlis Scholarship, funding their studies with Professor Gabor Takacs–Nagy at the Haute Ecole de Musique de Geneve. Here they won the conservatoire’s most esteemed Prix d’Exellence. 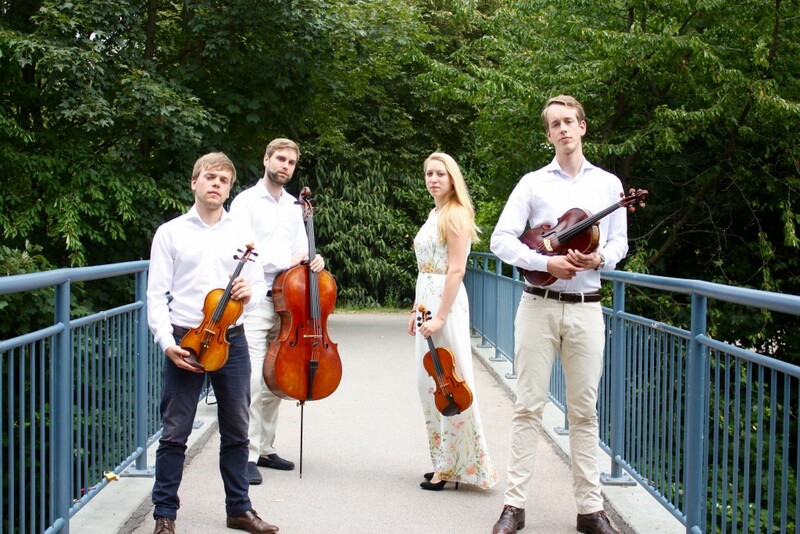 The quartet held the Richard Carne Junior Fellowship at Trinity Laban Conservatoire of Music and Dance for two years and is currently resident at Bangor University. As Park Lane Group Young Artists, the quartet gave debut recitals at the Purcell Room and Wigmore Hall. Recent notable performances include concerts at Vienna Konzerthaus, Wigmore Hall Coffee Concert Series, Aldeburgh Music Britten Centenary Weekend (broadcast live on BBC Radio 3), Queen Elizabeth Hall; Festival Quatuors a Bordeaux, Dartington, West Cork Chamber Music Festival, Bellerive Festival, North Norfolk Festival, Mondsee Festival and Manchester’s Bridgewater Hall. In 2010, they performed a new collaborative work by young British composer Charlotte Bray in Verbier Festival, Festival d’Aix-en-Provence and Aldeburgh Festival. 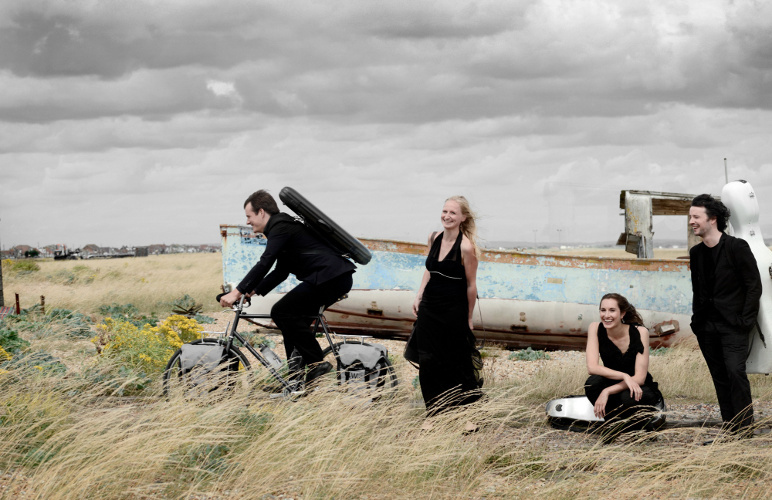 In 2013 the quartet held a residency at St John’s Smith Square in which they collaborated with Scottish cellist Philip Higham and pianist Jeremy Young to perform the complete Britten quartets alongside other significant chamber works. This year the quartet has taken over the artistic directorship of Alfriston Summer Music- a highly successful festival that has been running for 10 years. The quartet has studied with Gabor Takacs-Nagy, Eberhard Feltz, Andras Keller and Quatuor Ebene, and attended IMS Prussia Cove and the Britten-Pears International Academy of String Quartets. The quartet continues to broaden its repertoire by initiating collaborative chamber music and cross-arts projects; in 2012 the quartet founded Quercus Ensemble, a mixed chamber music group based in Northern Ireland. The quartet works regularly with Shobana Jeyasingh Dance and has collaborated with award winning jazz group ‘Empirical’, performing in the London Jazz Festival at the Queen Elizabeth Hall and appearing on their album, ‘Tabula Rasa’. This season the quartet will curate a series of concerts in collaboration with ‘Women of the World’ Festival which explore neglected female composers. They recently released their debut recording – Mozart Piano Concertos with pianist Jeremy Young on Meridian Records and are part of a collaborative recording of the complete works for string quartet by Mendelssohn, released by Champs Hill. Find out more at www.benyounesquartet.com. Described by The Strad as presenting “a masterclass in unanimity of musical purpose, in which severity could melt seamlessly into charm, and drama into geniality″, the Carducci Quartet is recognised as one of today’s most successful string quartets. Performing over 90 concerts worldwide each year the quartet also run their own recording label Carducci Classics; an annual festival in Highnam, Gloucester; and in September 2014, curated their first Carducci Festival in Castagneto-Carducci: the town from which they took their name. Winners of international competitions, including the Concert Artists Guild International Competition 2007 and Finland’s Kuhmo International Chamber Music Competition,the Anglo-Irish quartet has appeared at prestigious venues across the globe including the Wigmore Hall, London; National Concert Hall, Dublin; Tivoli Concert Hall, Copenhagen; Carnegie Hall, New York and Library of Congress and John F Kennedy Center, Washington D.C. Festival appearances include Cheltenham Music Festival; Festival Messiaen au pays Meije; West Cork Chamber Music festival; Kuhmo Festival; and the Wratislavia Cantans Festival in Poland. 2015 saw the quartet present the complete catalogue of Shostakovich’s String Quartets across a number of international cycles to commemorate 40 years since the composer’s death. The project was`accompanied by a recording of quartet’s no. 4, 8 and 11: their second disc for Signum Classics. Further to this, the quartet toured Germany, Holland and Colombia and collaborated with guitarist Craig Ogden, clarinettist Emma Johnson, cellists Guy Johnston and Christian-Pierre La Marca. Highly celebrated for their interpretation of contemporary repertoire, the Carducci Quartet is regularly invited to perform new works. This season they present the world premiere of Anthony Gilbert’s cello quintet Haven of Mysteries with Guy Johnston and curate two projects at Kings Place, London around Steve Reich and Philip Glass. 2013 saw the release of two recordings: Into the Ravine with Nicholas Daniel – their debut release for Signum Classics – featuring British works composed for the ensemble, and Alexander Raskatov’s Monks Music, listed as one of the top 5 classical recordings of 2013 by the Irish Times. The quartet has also received wide critical acclaim for recordings on their own record label and their catalogue features two world premiere recordings: works by G. Whettam (‘recording of the month’ MusicWeb International) and J. Horovitz (‘beautifully crafted works…excellent performances’, BBC Music Magazine). They have also recorded Vivaldi and Piazzolla with the Katona Twins Guitar Duo for Channel Classics, as well as Philip Glass for Naxos. In 2011, the Carducci Quartet was nominated for a Royal Philharmonic Society Award for their family concert ‘Getting the Quartet Bug!’ Educational work remains important to the quartet who set up the Carducci Music Trust, to support their work in schools. The quartet also runs chamber music courses for young musicians in the UK, France and Ireland, and regularly coach on the National Youth String Quartet Weekend. Despite the relatively short existence, the Acanthus String quartet has already accomplished several special things; a live radio performance for the Dutch classical channel ‘Radio 4’, a concert in the small hall of the Amsterdam Concertgebouw and their performance at the Amsterdam Chamber Music Festival. In the summer of 2012 they were invited to participate in a festival in Brasil, where they had masterclasses with: Antonio Meneses, Vogler Quartet, Johannes Moser and the Smetana Trio. The members of the quartet, Jos Jonker (1992), Daniel Frankenberg (1990), Bas Bartels (1990) and Veerle Schutjens (1991) are all students at the Conservatory of Amsterdam and they founded the quartet in september 2010, while studying there. Since 2012 the quartet has been accepted to the Dutch String Quartet Academy (NSKA), where they, besides their individual lessons with Ilya Grubert, Kees Koelmans, Richard Wolfe and Monique Bartels, have lessons with Marc Danel and Johannes Leertouwer. As part of their studies in the NSKA they also had masterclasses with Frank Reinecke of the Vogler Quartet and Peter Cropper of the Lindsay String Quartet. The Dutch National Instrument Foundation loaned a bow to both Bas and Veerle. The Evropska Quartet is a young British string quartet comprising graduates of the Royal Northern and Guildhall colleges of music. 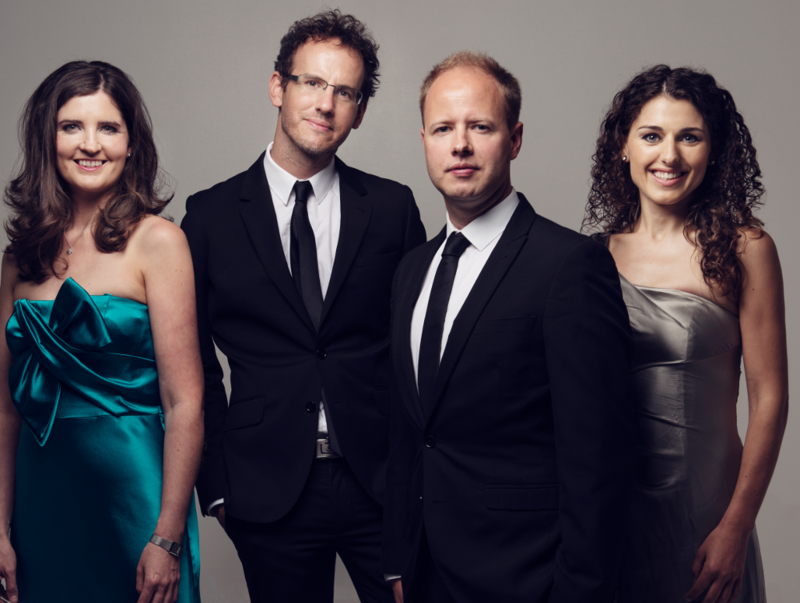 Described as a ‘quartet to watch’ by Seen and Heard International, the group perform regularly both in London and throughout Europe, recently appearing at the 200th Anniversary Lizst Festival in Switzerland and Westminster Abbey, London. Formed in the summer of 2010, a month later they were awarded a full scholarship to study at The Curso Internacional de Musica in Spain with The Badke Quartet. In October 2010 the quartet was offered the opportunity to study with Pavel Fischer (Skampa Quartet) in Prague, where they were resident until the summer of 2011. During this time the Evropska Quartet performed in and around Prague, returning to the UK for concert series’ in London and around the UK. They also received masterclasses from the Skampa and Wihan Quartets. In December 2010 they collaborated with Czech folk group Bardolino and Pavel Fischer to perform one of his own compositions and a set of Janacek folk songs. The quartet is now based in London. They study with Rainer Schmidt (Hagen Quartet) at the Hochschule fur Musik in Basel, Switzerland and with Marc Danel and Stephan Metz at the Netherlands String Quartet Academy. They have also received coaching and masterclasses from Eberhard Feltz, the Endellion Quartet, Peter Cropper, Ysaye Quartet, Leipziger Quartet and Alfred Brendel. The quartet hold the position of Quartet in Residence at Stoke Newington School, London where they deliver workshops for pupils and give concerts. The Quatuor Varèse is a string quartet made up of 4 young professional musicians all having graduated from Lyon’s Conservatoire Supérieur de Musique. The Quartet was founded in 2006 and made its debut in the Quartet Class of Zoltan Toth and Reiko Kitahama, both members of the Quatuor Ravel. Since then, they have played regularly in the Varèse Concert Hall (from which the name of their quartet was taken) during the Season of the Lyon’s Conservatoire Supérieur de Musique. The musicians soon became acquainted with the Quatuor Debussy with whom they started a thorough study, through master classes and festivals such as the Cordes en Ballade and the Festival de l’Epau. In December 2007, the quartet joined the Quatuor Ysaye’s quartet class in the Paris Conservatoire (CRR). In September 2009, they were invited to take part in Miguel Da Silva’s master class in the Ravel Academy of St Jean de Luz. Their performance was rewarded by the Rotary-Lyons Prize. In October 2009, they took part in the Lyon’s Chamber Music International Competition where they have been distinguished by an ADAMI Prize. During that competition, the Palazetto Bru Zane in Venice was impressed by their performance and invited the Quartet to play the music of lesser-known French composers in its universally renowned programme. The 2010-2011 Season took the young quartet to Berlin, Venice (Palazetto Bru Zane), Québec (Palais Montcalm), Paris (Radio France) and started with a tour in Japan (November 2010). However the quartet remains based in the Rhône Alpes region where it started, particularly by taking part in the Rhône en Scène project which is sponsored by the Conseil Général du Rhône. In April 2011, the quartet was awarded a FNAPEC prize at the FNAPEC-Musiques d’ensembles European chamber music competition. The Kamus Quartet was formed in Helsinki in November 2002 by four first-year students at the Sibelius Academy, where they also began their studies with Risto Fredriksson. In the summer of 2003, they met the Belgian Danel Quartet at the Kuhmo Chamber Music Festival and worked intensively with them in Kuhmo and in Brussels. In 2004, with the help of the Danel Quartet, Kamus met Hugh Maguire in London and, in the winters of 2004 and 2005, had the great privilege of studying with him at Aldeburgh as the Britten-Pears Music School’s Quartet in Residence. At the same time they continued their studies in Finland with the members of the New Helsinki Quartet. In 2004, the Kamus Quartet also entered two competitions: the Kuhmo International Chamber Music Competition, where they won 3rd prize overall, and the prize for best performance of the compulsory piece; and the national Erkki Melartin Competition, where they won 1st prize. After the Kuhmo competition, Kamus had the opportunity to participate in the sessions of the European Chamber Music Academy, ECMA; first as a guest ensemble from the Kuhmo Festival and, since 2006, as an official ECMA Ensemble Fixe. From the very start, the aim of the Kamus Quartet has been to offer concerts with a versatile program, and their repertoire already consists of more than 60 works. Kamus has given concerts in the largest festivals and cities in Finland, and have had concerts (for example) in London, Paris, Vienna, Berlin and Brussels. The quartet has collaborated with many Finnish contemporary composers, whose works Kamus has premiered, as has also recorded for the Finnish National Broadcasting Company (YLE). The Elias String Quartet was formed in 1998 at the Royal Northern College of Music in Manchester where they worked closely with the late Dr. Christopher Rowland. They also spent a year studying at the Hochschule in Cologne with the Alban Berg quartet. Other mentors in the Quartet’s studies include Hugh Maguire, György Kurtág, Gábor Takács-Nagy, Henri Dutilleux and Rainer Schmidt. The quartet have been chosen to participate in BBC Radio 3′s prestigious ‘New Generation Artists’ scheme and are the recipients of a 2010 Borletti-Buitoni Trust Award. In April 2010, their disc of Mendelssohn, Mozart and Schubert on the Wigmore Hall Live label was given the BBC Music Magazine Newcomer Award. Other highlights of the 2009/10 season have included a month long tour of Australia, their first visit to Italy with cellist Alice Neary and a cycle of Mendelssohn’s Chamber Music at King’s Place, London. This year they had their debut at the Concertgebouw in Amsterdam, a week long tour in Europe with pianist Jonathan Bliss, appearances at The Sage Newcastle, Bridgewater Hall Manchester and the City of London, Cheltenham and East Neuk Festivals. Based in the UK, the Carducci Quartet is recognised as one of today’s most successful string quartets, performing over 90 concerts worldwide each year whilst running their own annual festival in Highnam, Glos and recording label Carducci Classics, as well as holding residencies at Cardiff University and Dean Close School, Cheltenham. Winners of international competitions including the Concert Artists Guild International Competition 2007 and First Prize at Finland’s Kuhmo International Chamber Music Competition, the Anglo-Irish quartet have appeared at a host of prestigious venues worldwide; Carnegie Hall, Washington Library of Congress, The Wigmore Hall, National Concert Hall, Dublin, Tivoli Concert Hall. This season will see the quartet’s debut performance at the John F Kennedy Center, Washington USA. Festival appearances include West Cork Chamber Music festival, Wratislavia Cantans Festival and Cheltenham Music Festival where they will hold a residency in Summer 2013. Highly celebrated for their interpretations of contemporary repertoire, the Carducci Quartet is regularly invited to premiere new works and recent highlights include a new String Quartet by John McCabe and Oboe Quintets by Michael Berkeley and Sven-Ingo Koch with Nicholas Daniel. The Carducci Quartet were nominated for a 2011 Royal Philharmonic Society Award for their family concert ‘Getting the Quartet Bug’. Educational work remains important to the quartet who set up the Carducci Music Trust, to support their work in schools. The quartet also runs chamber music courses for young musicians in the UK, France and Ireland and regularly coach on the National Youth String Quartet Weekend. Formed in 1995 whilst students at the Music University in Bucharest, Romania, the ConTempo String Quartet have toured the world extensively and have won a record of 14 international prizes for ensemble playing. The quartet has become one of the most celebrated young string quartets performing today. In 1999 they took up a Fellowship at the Royal Academy of Music where they taught chamber music classes and had the chance to meet and work with some of the most famous quartets in the world. Since 2003, they have been Quartet in Residence on the West Coast of Ireland embarking on a unique project. Attracting internationally known musicians from all genres to Galway and performing collaborative concerts. An annual ConTempo Summer Festival, which has featured collaborative artists such as Emma Johnson, Martin Lovett, Bruno Giuranna, Hugh Tinney, John Feeley and Maírtín O’Connor. ConTempo Quartet had the honour to be invited to perform in front of great personalities such as the late Pope John Paul II at Castel Gandolfo in Italy, for Prince Charles in UK (in London and Highrove) , for Nelson Mandela, former President of South Africa and EU Ministers and for the famous Hollywood actors Angelica Houston, Angela Lansbury and Martin Sheen. In 2002 & 2003, ConCorda welcomed a quartet made up of members of the Irish Chamber Orchestra. Katherine Hunka, Diane Daly, Joachim Rower and Ben Rogerson. The Irish Chamber Orchestra is a world class orchestra based in Ireland, renowned for its energy, unique sound and outstanding musicianship. Following a succession of illustrious Artistic Directors including Fionnuala Hunt, Nicholas McGegan and Anthony Marwood, the orchestra has taken a new approach, appointing two artistic partners who are taking the orchestra on a musical voyage of discovery over the coming years. Working with the celebrated Hungarian maestro Gábor Tákacs Nagy (Principal Artistic Partner) and one of Germany’s finest composers and virtuoso clarinettists, Jörg Widmann (Principal Guest Conductor/Artistic Partner), the Irish Chamber Orchestra strengthens its position as a force to be reckoned with on the international music scene. Under Katherine Hunka‘s leadership the orchestra is recognized as one of Ireland’s world-class cultural assets. ConCorda were very lucky to have such a distinguished group of musicians perform and teach as a quartet for these two courses. The Callino Quartet is widely considered to be one of the finest young ensembles to have emerged in Europe in recent years. They were formed at the West Cork Chamber Music Festival in 1999 where they immediately felt a deep musical affinity. Since then they have impressed audiences and critics both at home and abroad with their fresh and enthusiastic performances. Based now in London, the Quartet has cultivated a wide ranging, diverse and challenging repertoire. They have performed and collaborated with many diverse musicians including the Belcea string quartet, double bassist Edgar Meyer, pianist Barry Douglas, singer Patricia Rozario, rock band Arcade Fire, Bell Orchestre and jazz musicians John Abercrombie and Sophie Dunér. They are passionately committed to contemporary music and have worked with composers Edgar Meyer, Peteris Vasks, Aleksandra Vrebalov, Alexander Knaifel, Franghiz Ali-Zadeh, Ian Wilson, Raymond Deane, Ronan Guilfoyle and Kimmo Hakola closely on their works for string quartet. Winners of several international prizes and distinctions, including second prize in the 2008 Tromp International String Quartet in the Netherlands, the development of the quartet has included studies in 2008 with Rainer Schmidt (Hagen Quartet) at the Musik Akademie in Basel, Switzerland. In February 2010 they were a resident quartet at the Banff Centre for the Arts in Canada and gave their Carnegie Hall début in March, at the invitation of the Kronos Quartet. Winner of the 1988 London International String Quartet Competition and now in its twenty-fourth concert season, the RTÉ Vanbrugh Quartet is one of Europe’s most successful ensembles internationally recognised for its beauty of sound, clarity of texture and integrity of interpretation within an unusually wide and varied range of repertoire. Familiar visitors to all the main UK festivals the Vanbrugh Quartet also broadcasts frequently for BBC Radio 3 and performs regularly at London’s Wigmore Hall and South Bank.The Quartet enjoys a thriving international career with past appearances including concerts in Berlin (Konzerthaus), Amsterdam (Concertgebouw), Hungary (Liszt Academy), Poland (Lancut Festival), Spain (Galicia Festival), Flanders Festival, Menuhin Festival, Gstaad plus numerous visits to Scandinavia where recordings were made of the complete Beethoven quartets. The quartet tours the USA on a regular basis with performances in Carnegie Hall, New York and The Kennedy Centre in Washington. Based in Cork as Resident Quartet to Radio Telefis Eireann, Ireland’s national broadcasting service; the members of the Quartet are also Artists in Residence to University College, Cork, and founders of the internationally acclaimed West Cork Chamber Music Festival. Make a donation to ConCorda at PayPal. The students here don't only learn music, they learn what it is to be a musician. The best thing about ConCorda was the friends that I made from all over Ireland. I loved every minute of the course and can’t wait to go again next year. Read what past students have written about the course here or see the timetable for a typical day. ConCorda © 2019. All Rights Reserved.